Virgin Voyages is currently building its first cruise ship, the Scarlet Lady, which will set sail at the beginning of 2020. However, with its much-anticipated ship on the way, the new cruise line has unveiled details of its exclusive RockStar Suites. 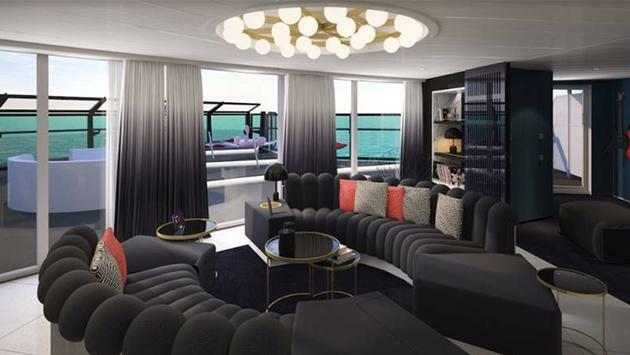 The suites are steeped in the Virgin brand’s rock and roll heritage and offer a fresh take on the glamour of yachting. The suites’ retro-futurism design, spearheaded by Tom Dixon’s Design Research Studio, is inspired by mega yachts and the glory days of rock and roll and features a palette of deep blues used with iridescent dichroic elements to echo the deep blue color of the sea. As expected, there are a number of VIP perks associated with these exclusive rooms. 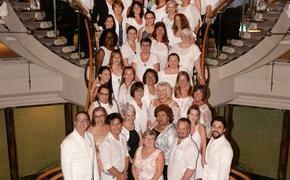 The Rockstar Coordinator is a personal assistant that is assigned to each of these staterooms. Guests also receive private transportation, a personal wardrobe team for packing and unpacking, a complimentary pressing service, a nightly express swimsuit drying service and exclusive early access to onboard entertainment and restaurants. Passengers booked in this category also receive exclusive access to Richard’s Rooftop–a secluded, members-only club for guests in the RockStar Suites to bask in the sun or have a drink under the stars. Onboard the Scarlet Lady, there will be 78 RockStar Suites in total, with eight different variations. All will have a sea terrace, electric, adjustable lighting including blackout curtains and a gold-plated vinyl record player accompanied by an en-suite collection of classic records. The largest is the Massive Suite, with 2,147 square feet of space and an outdoor Jacuzzi on the expansive sea terrace. There is also a private outdoor shower, hammocks, a catamaran net for stargazing and more. The Fab Suite is 950 square feet, that offers an extra-long sea terrace with an outdoor shower, stargazing loungers, a hammock and a champagne table. The Posh Suite is slightly smaller at 833 square feet. It features a spacious living room, a peek-a-boo shower and a sea terrace with lounge chairs, outdoor shower and champagne table. The Gorgeous Suite is 570 square feet and offers an open plan lounge and bedroom, a bathroom with a window to see the ocean, an expansive sea terrace with an outdoor shower, lounge chairs and a hammock. The 482-square-foot Brilliant Suite features an open-concept living area and a sea terrace complete with a hammock swing chair. The Cheeky Corner Suite is between 607 and 847 square feet and features panoramic views and larger balconies with sofa loungers, interconnecting doors able to connect with adjacent sea terrace cabins and more. Sweet Aft Suite ranges from 416 and 661 square feet and is positioned centrally at the aft of the ship, with the most-Instagrammable wake view directly from the bed or even the shower. The Seriously Suite is the smallest of the RockStar Suites with sizes ranging from 352 to 357 square feet in size. The rooms feature 352 and 357an open plan lounge and bedroom, sea terrace with chairs, plus a luxurious bathroom with a window to see the sea.